Wembley Way, the arch, a record crowd - the Women's FA Cup final has come a long way since Dunstable Town hosted the game 40 years ago. After unprecedented success for England's Lionesses at the World Cup, Chelsea beat Notts County 1-0 at Wembley in front of a record crowd of 30,710 to take a landmark walk up the 107 steps to lift the trophy at the home of football. Yet former England forward Sue Lopez, one of the stars of the Southampton side that reached 10 of the first 11 finals, never imagined Wembley would one day host the big game. "If you asked any of my former colleagues they would be so envious," Lopez told BBC Radio Solent. "It has moved on tremendously quickly. "For us, it was just relief to be at a decent ground, with decent referees, decent goalposts with nets and our fans there with us, playing a decent team." Things have changed a bit since the 1970s, when the then-dominant team in the English game used to train on their local common. "It was awful up there because there was no nets, a shed to change in, a kind of toilet and a cold tap outside which we could use to wash our boots," Lopez added. "There was a big lake - sometimes the ball would go in there, so it was very primitive. "The Football Association didn't condone women's football then, so we weren't allowed to play on any affiliated pitches. That held things back a bit." 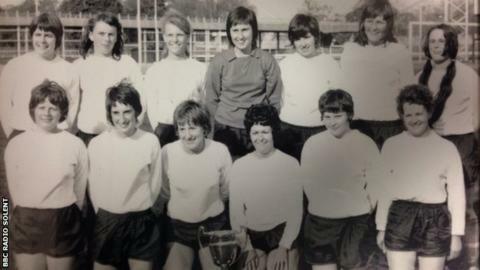 Lopez and Southampton were victorious in the first Women's FA Cup - then known as the Mitre Challenge Cup - in 1971, beating Scottish side Stewarton & Thistle 4-1 at Crystal Palace National Sports Centre. "It was fantastic," former captain Lesley Lloyd said. "It was like being at Wembley for me. "I'll never forget that, just lifting that cup and thinking we've actually won a cup, they've actually recognised that ladies can play football." Sue Lopez won 22 England caps in her 20-year playing career. The forward spent 19 years with Southampton and also had a one-year spell at Italian Serie A side Roma. But after dominating the domestic game in England for a decade, Southampton have not won the cup since 1981. Now playing in tier six of the women's football pyramid, Southampton WFC finished bottom of the Southern Region Women's Division 1 North last season. They were knocked out in the preliminary round of the 2014-15 Women's FA Cup competition, losing 3-2 at home to Fleet Town. But why did their success fade? "We got a bit old for it all so we had other things to do," Lopez explained. "Some of the players that were at the forefront, they moved on. "I think it was the cost and because there was no player pathway - we didn't have a youth team. There wasn't that group of girls that would gradually take over. "The problem then was there was no real development model." There will be a new name on the Women's FA Cup this weekend, with Chelsea Ladies and Notts County Ladies both bidding for their first major trophy. That reflects the evolving, competitive nature of the modern-day Women's game, but with eight Women's FA Cup wins, Southampton are the second-most successful team in the history of the competition. Though they are searching to find the missing, original trophy, their decade of dominance will forever be in the history books. But how do they compare with the stars of 2015? Lloyd, who used to live opposite Southampton men's old stadium, The Dell, believes her team could have held their own against modern-day sides if they had received the same fitness training. "What they have nowadays is unbelievable, the doctors, the physios, the training facilities," Lloyd added. "We had nothing. It was tough. "(After a game) I used to get in a hot bath that my mother-in-law had run and then have a big roast dinner afterwards. "It worked and I wouldn't change any of it for the world." Lesley Lloyd and Sue Lopez were speaking to BBC Radio Solent's Jenna Hawkey. Additional reporting by Josh Hunt.